No. 1 Holy Innocents’ (25-7) erased all bad memories of state championships past to blow past No. 3 Wesleyan (28-4), leading from the opening tip to final buzzer to capture the program’s third state title, first since beating the rival Wolves in overtime 66-64 back in 2016. 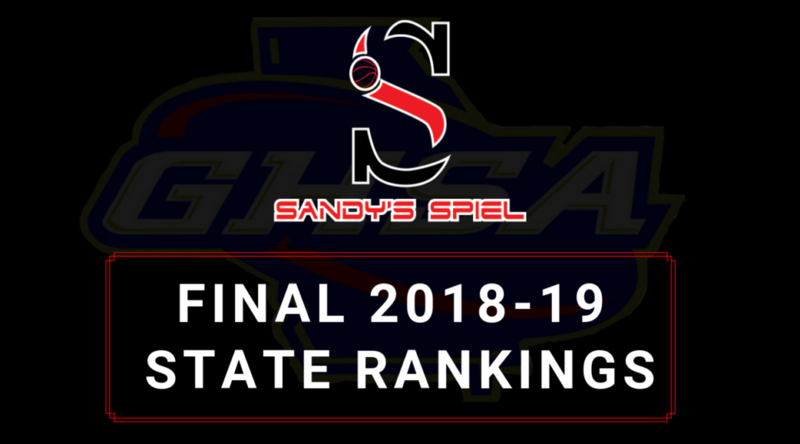 Sweeping Wesleyan in the regular season had proved to be a kiss of death, losing in 2015, 2017 and 2018 in the title game after dominating outside of the state tournament. 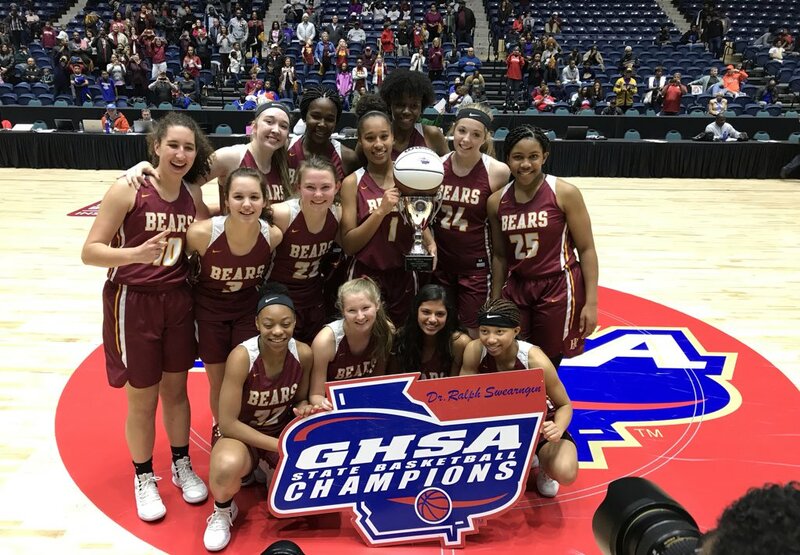 After beating Wesleyan 68-63 and 72-50 in the Region 5 championship this season, the Golden Bears were able to repeat their success on the biggest stage. Holy Innocents’ started quick in each quarter to grab an early lead in the first, then growing it by starting the second quarter on a 7-1 run to take a 27-18 lead into the half. The Golden Bears started the third quarter 6-0 and fourth quarter 12-2 to put the game out of reach. Wesleyan had no answer for 6-foot-4 sophomore Jill Hollingshead, who finished with a game-high 25 points, 10 rebounds and 3 blocks. Junior Jada Farrell came to life in the second half scoring 15 of her 18 points in the final 16 minutes. Freshman Marya Hudgins scored 9 points before fouling out while sophomore point guard Cierra Foster controlled the action with 8 points, 6 rebounds, 8 assists, 2 steals and 1 block. In the loss, junior AC Carter led Wesleyan with 17 points and 10 rebounds. Paige Lyons (11) and Nicole Azar (10) each cracked double digits as the Wolves were denied their 14th state title. Trailing 49-48 heading into the fourth quarter, No. 1 St. Francis (28-4) rode Xavier-commit Dwon Odom to the finish line in a back and forth fourth quarter. 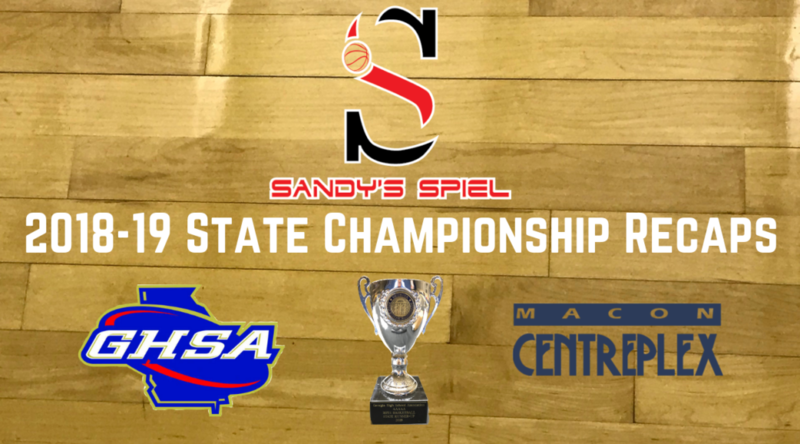 After scoring 11 points in the first half, Odom was held scoreless in the third quarter before he broke loose to score 17 of the Knights’ 25 fourth quarter points to finish with a game-high 28 points and his first state championship. 6-foot-6 sophomore Jusaun Holt scored the first eight points of the game for the Knights and paced St. Francis as they held a narrow 35-33 lead at the half. Holt finished with 16 points, 9 rebounds and 5 assists as the Knights needed all of his firepower to help fend off a balanced Chargers group. Kelvin Jones II and Mekhi Cameron, battling a shoulder strain, finished with 17 points apiece to lead No. 2 ELCA (22-9). In the fourth quarter, Odom began to take over, scoring eight straight points in a stretch that grew the Knights’ lead to 59-53 with 4:20 remaining to play. Odom hit a tough floater in the lane over College of Charleston-signee Trevon Reddish with 1:29 left to give St. Francis a 67-62 lead, a defining moment in his bright career. ELCA would not go away however. The Chargers cut the lead to 67-64 with 56 seconds remaining and saw Chase Ellis miss a pair of free throws. The Chargers were unable to get a clean look at the basket however as Cameron turned the ball over which started a foul fest. With 8.8 seconds left, Odom was sent to the line where he sank both free throws to put the game on ice at 71-66. Cameron knocked down a three with 2.5 seconds left but with no timeouts left the Chargers had to call one to stop the clock which resulted in a technical. Odom went 1-of-2 from the stripe to seal the deal. In the win, St. Francis received 8 points apiece from Chase Ellis and freshman Seth Hubbard. Felix Uadiale posted 16 points, 9 rebounds, 2 steals and 2 blocks, doing damage in the second half. Reddish ended his career with 12 points, 9 rebounds and 9 assists. 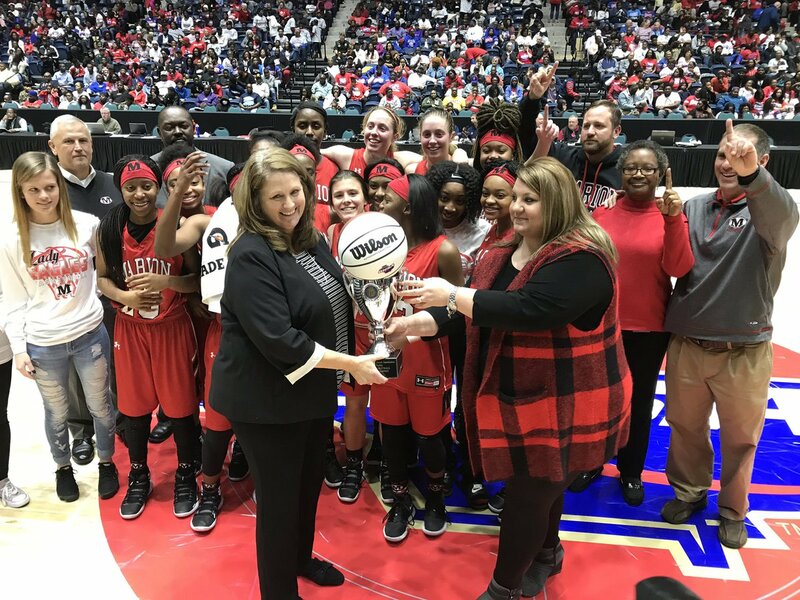 Bruised and banged up, dealing with cramps along with general fatigue and other battle wounds, twins Ansley Whitley and Ashley Whitley left the Macon Centreplex with a state championship, No. 1 Marion County’s first in school history. The Virginia Tech softball-signees overwhelmed No. 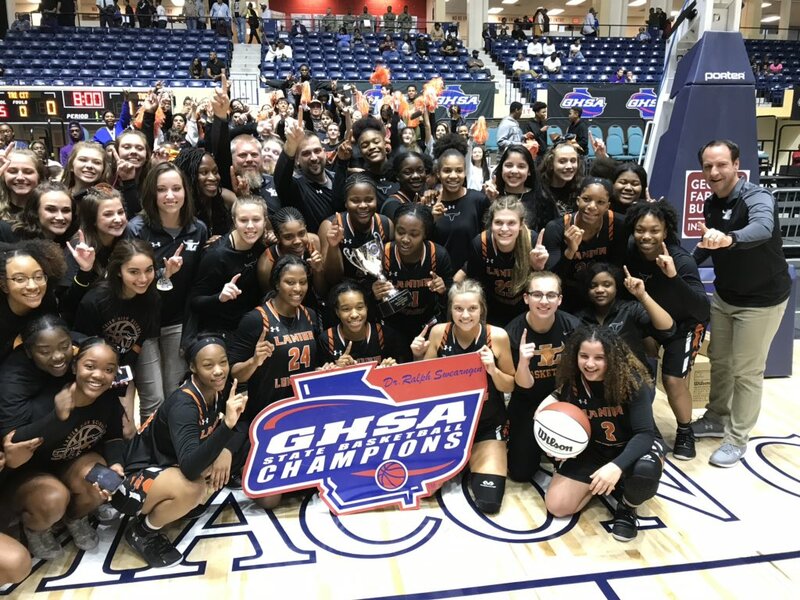 4 Calhoun County (29-2) with their size and athleticism as Region 4 Player of the Year Ansley finished with 20 points (12-14 FT), 9 rebounds and 3 blocks while Ashley added 12 points and 12 rebounds, erasing last year’s title defeat from memory and ending their illustrious careers on top. Jameisha Williams added 13 points, 6 rebounds and 4 steals in the win. As a team, the Eagles (28-1) shot 21-of-30 from the foul line while Calhoun County went 3-of-8 and struggled from beyond the arc at 3-for-26. Destiny Hightower had a team-high 12 points and 4 rebounds while Jateriah Winbush netted 10 points for the Cougars. Takia Davis was saddled with foul trouble nearly the entire game and collected just 4 points, 4 rebounds, 2 steals and 2 blocks in 13 minutes. Region 1 Player of the Year Kanashus Enocher was held scoreless, going 0-of-12 from the field. No. 3 Treutlen’s heart was broken on the big stage as No. 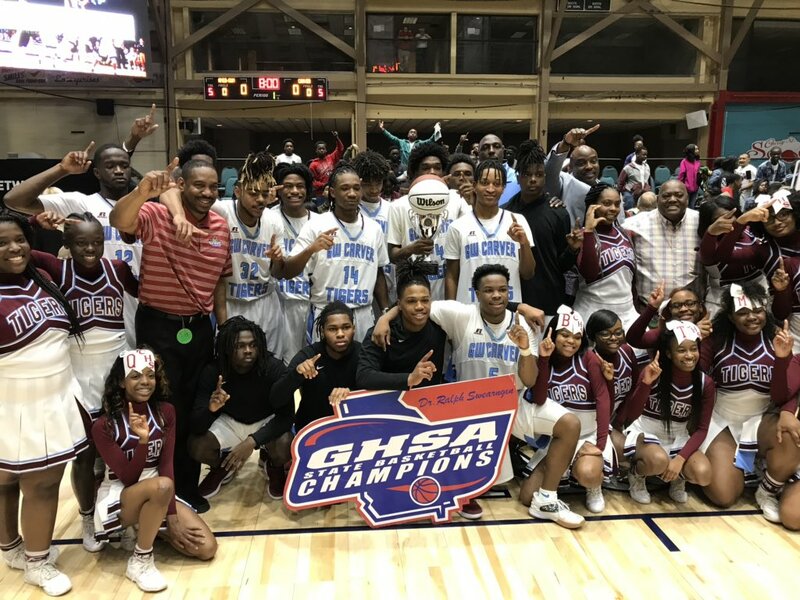 1 Calhoun County clinched an undefeated 32-0 season and handed the Vikings their second loss of the season after trailing for a majority of the fourth quarter before sophomore guard Tykevious Curry dished off the game-winning assist to Quanderious Powell with two seconds left as time expired to stun the Vikings. A frantic pace from the start, Calhoun County led 16-14 after one and 37-36 at the half as Juwaun Wiley paced the Cougars with 11 points and Jahmad Wiley 9. Treutlen (30-2) used a balanced attack to keep pace with Calhoun County and trailed 55-53 after three quarters following a wild last second hoop from Kam Jordan which gave the Vikings momentum. Treutlen surged ahead and crushed the Cougars on the glass, outrebounding them 27 to 13 in the second half. Before Calhoun County’s game-winning layup, their last lead came at the 5:59 mark up 59-57. Treutlen tried to extend the lead behind James Byrd (17 points & 7 rebounds) and Arkavias Lovett (15 points & 8 rebounds) but Calhoun County kept close, even with Bryan Smith being held to 9 points on the night — 7 coming in the first half. With 57.6 seconds left, it looked as if Treutlen could be making their closing move as Lovett converted a tough And-1 jumper in the lane to make it 66-63 but after Tafarjae Jordan split a pair of free throws, Jahmad Wiley hit a gutsy floater in traffic to knot the game up at 67 with 27.3 seconds left, two of his game-high 18 points . The Vikings turned to the 6-foot-6 Lovett again inside, but his short jumper was well contested and off the mark, giving the ball back to Calhoun County with 8.8 seconds left. Having to go the length of the floor, Coach Marcus Shaw turned to Curry, the Co-Region 1 Player of the Year to make the biggest play of the year. 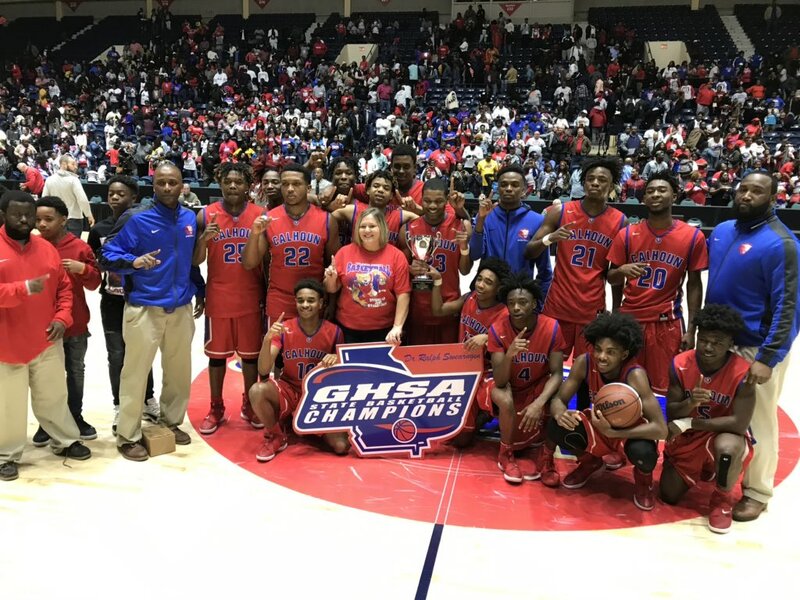 Curry, who scored 12 of his 16 points in the second half, raced down the floor and dropped a dime to Powell for the game-winning hoop, not leaving Treutlen enough time to get off the mat. Though the Cougars were outrebounded 46-31, they were able to score 21 points off turnovers and saw senior Juwaun Wiley contribute 13 points and 5 rebounds. Treutlen’s backcourt of juniors Kam Jordan and KaSabian Mitchell finished with 14 points and 11 rebounds and 6 points, 8 rebounds, 4 assists and 2 steals, respectively. No. 3 Treutlen 67@CurryTykevious with the game-winning assist to Quanderious Powell! Kayla Sesberry’s three with 4:35 remaining in the second quarter gave the Lady Astros a 21-18 lead they would never relinquish as No. 3 Douglass (27-6) captured the school’s first state title and held off a late rally from the Bobcats. No. 8 Early County (27-5) led 15-12 after the first quarter as 6-foot-3 star sophomore Makayla Timpson scored seven points and blocked four shots. Jacksonville State-signee Nekiyah Thompson kept the Astros close and midway through the second quarter Douglass seized the lead and took a 28-25 advantage into the half with 6-foot-2 senior Kayla Pruitt altering the game with her play off the bench, posting six points and three rebounds to try and slow down Timpson. In the third quarter Pruitt’s interior play, Thompson’s shooting and Ashuntee Weems’ slashing helped Douglass grow a 41-30 lead with 2:27 left to play, their largest lead of the night before settling for a 41-36 lead following back-to-back threes from Early County’s Taliah Wesley to close the frame. Held to just two points in the third quarter, Timpson got back to work in the fourth quarter as her and post mate Ta’Ziaya Jones started to find their footing, Timpson scoring five points in the quarter along with Jones who scored just two points over the opening three periods. The Bobcats cut the lead to 43-41 with 5:32 left but the Astros held on and maintained a 51-49 lead with 2:07 remaining when Ikenya King split a pair of free throws after Sesberry fouled out Timpson at the 2:28 mark with the Astros up 50-47. At the 1:43 mark Jones was able to draw the Bobcats even at 51 but it would be Early County’s last hoop of the game as the Astros would close on a 6-0 run and hold the Bobcats scoreless the rest of the way. Thompson’s slicing layup with 39.6 seconds left proved to be the clincher as the Bobcats stopped defending near midcourt after they thought they heard a whistle. Thompson finished her career with a game-high 23 points, 3 assists and 3 steals while Pruitt provided an integral 12 points, 8 rebounds, 1 assist, 1 steal and 4 blocks. Ashuntee Weems finished with 10 points followed by Sesberry’s 6. Timpson posted 20 points, 14 rebounds, 4 steals and 5 blocks before fouling out. Freshman guard Jordan Eafford added 10 points, 9 rebounds and 1 block while Jones chipped in 7 points, 12 rebounds and 2 steals. Taliah Wesley netted 9 points. Janya Williams was held to 2-of-11 shooting, 1-of-8 from three for 5 points after hitting five threes and scoring 21 points in the semifinals. In and out of the line up throughout the season and not even listed on their MaxPreps roster, senior Zyquan Morton found playing time and his three-point stroke at the right time — the state tournament — as Morton helped balance a once one-dimensional offense and help No. 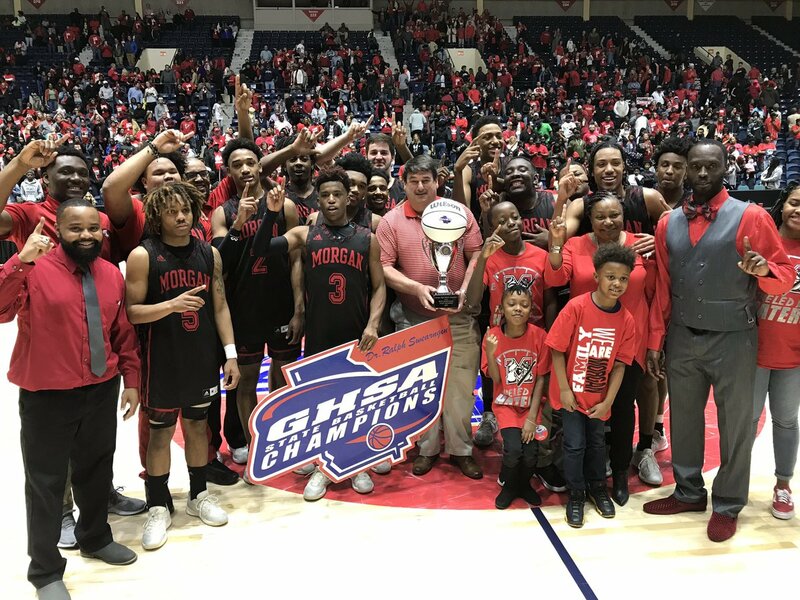 3 Therrell (27-8) to their first ever state title by scoring 16 of his game-high 19 points in the first half, knocking down three three-pointers and six free throws. The Panthers opened quickly with an 8-0 run to start the game before No. 4 Vidalia (27-5) hunkered down with a 13-0 run spanning the end of the first quarter and into the second to take a 20-14 lead as senior forward Toriun Mull scored 10 of his team-high 14 points in the opening 16 minutes. Therrell answered the bell behind Morton, who hit a buzzer beating three to give the Panthers a 27-26 lead at the half. With Xavier McClendon hobbled, hurt at the 2:17 mark of the first quarter and unable to return until the third quarter where he went down again with a left leg injury and did not return with the Indians down 29-28 with 6:25 to play, Coach Tommy Dalley turned to a 2-3 zone to stymie the Panthers. Back and forth the two teams battled until it was Therrell who came away with a 38-35 lead after three quarters. A mini-run helped the Panthers go ahead 43-37 with 6:08 remaining as Robbie Armbrester broke free for a putback slam. 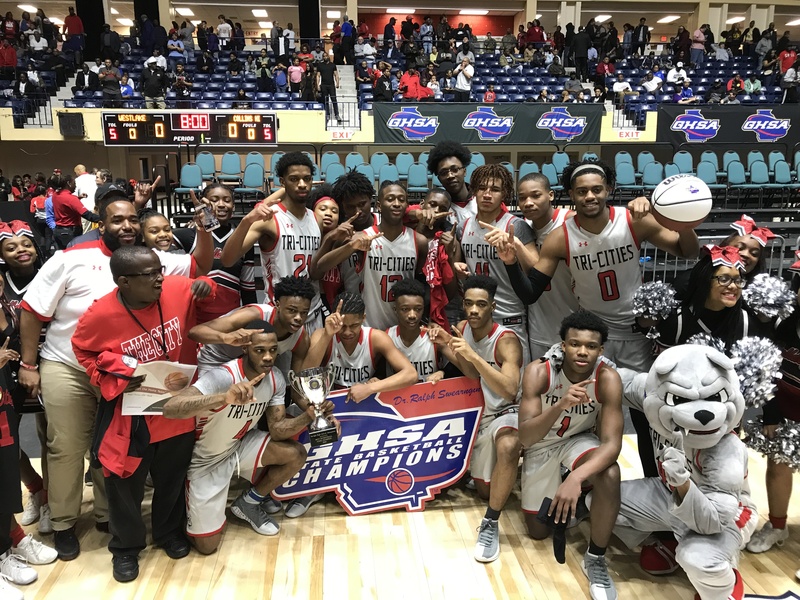 Morton scored his only points of the second half on a three ball that made the score 46-39 with 4:20 left, cracking the magic number of 46, the most points Vidalia had allowed during their postseason run. With the season slipping away, the Indians battled back with buckets inside from Galen White and Mull to cut the deficit to 47-43 with 3:14 remaining. Adam McCloud nailed a triple to make it a 49-46 game with 1:01 left and with 59 seconds to play, Anthony Jones came away with a steal. Following a Dalley timeout, Mark Wardlaw turned the ball over with 23.6 seconds. Roman Son, who scored all 10 of his points in the second half after attempting just one first half shot, split a pair of free throws before Wardlaw atoned for his mistake and buried a deep three to make it a 50-49 game with just 6 seconds left. RaSean Frederick turned the ball over as Johnathon Moody won a jump ball but in a loose ball scramble, Shawn Edwards was called with a travel with 1.3 seconds on the clock. Cam Fortson split free throws on the other end to ice the game. Therrell was outscored 34-22 in the paint by Vidalia but notched 24 points off turnovers to counter. Armbrester was held to 10 points, 4 rebounds and 4 steals in the win while Frederick netted 8. Vidalia got 10 points apiece from Jones and Wardlaw and saw their bench outscore the Panthers 33-0. Freshman K’lya Hankerson scored only five points but they were the biggest five points of the season as she drilled a three — her 10th of the season — with 1:21 left to play to give No. 2 Johnson-Savannah (22-8) the lead for good and repeat as state champs. The Atomsmashers had control in the first half before No. 4 Hart County (25-7) made their move in the final 16 minutes. Johnson led 13-7 at the end of one as senior forward Jasmine Thompson scored 11 points, attacking the paint and helping draw two fouls on 6-foot sophomore Taniyah Alexander. Johnson ran their lead to 24-12 at the 5:36 mark, their largest lead of the game when Checobie Hugie bounced in a three-pointer. Hart County was able to close the quarter strong however as Alexander scored eight points down low. With the lead dwindled to one-point, Region 3 Player of the Year J’Mya Cutter hit a three at the buzzer to push the Atomsmasher advantage to 29-25 heading into the half. Thompson continued her monstrous night in the third quarter but Western Kentucky-signee Torrion Starks began to find a groove and started putting pressure on Johnson’s backcourt. Shakendra Grove hit a pull-up jumper with 13 seconds left to give the Bulldogs their first lead of the game at 37-36 heading into the fourth quarter. Hart County claimed their largest lead of the game with 5:46 remaining in regulation as Starks converted a basket through contact but missed the free throw, making it 42-39. Hart County’s last lead was 42-41 before Hugie nailed a three at the 4:04 mark to pull the Atomsmashers ahead 44-42. Tied at 48 following a Starks layup, Hankerson struck with an unexpected three on the left wing with 1:21 remaining. The Bulldogs had to foul and saw the Atomsmashers miss the front end of two one-and-ones, but Abbygail McLane and A’Cira Teasley missed two clean looks from three on back-to-back possessions. With free throw shooting potentially on the verge to come back and bite the defending state champs, it was Hankerson who stepped up to the line to sink a pair of free throws to put the game away with 13.4 seconds left. Thompson finished her Atomsmashers career with a team-high 20 points and 8 rebounds. Cutter had 13 points, 4 rebounds, 2 assists and 5 steals while Hugie netted 8 points — five in the fourth quarter. Hart County was led by Alexander’s 21 points and 11 rebounds followed by Starks’ 15 points, 4 rebounds, 3 assists and 3 steals. A’Cira Teasley added 7 points and 6 rebounds. Grove was held to 5 points on 1-of-5 three-point shooting. No. 10 Hart County (24-8) led 5-4 at the 4:35 mark of the first quarter and never did so again as Region 8 bully No. 1 Morgan County (30-2) beat the Bulldogs for the third time this season to earn the school’s third state title, first since 2016. Able to match Hart County’s quickness and athleticism unlike many of the Bulldogs’ opponents during their tournament run, Morgan County held Hart County to 32.8 percent shooting as the senior trio of Tyrin Lawrence, Stevin Greene and Austin Peay-signee Alec Woodard overpowered the smaller Bulldogs on both ends. Lawrence, one of the state’s top unsigned seniors, finished with 19 points, 18 rebounds, 1 assist, 1 steal and 1 block while drilling 3-of-4 three-pointers and going 8-of-12 from the charity stripe. Greene put in 14 points, 4 rebounds, 4 assists and 1 block while Woodard netted 13 points and tallied 5 assists. Late season addition Malik Crawford paid dividends inside with 11 points and 4 rebounds. Hart County was led by senior guard Rex McCord who posted 19 points and 11 rebounds. Sophomore Shone Webb scored 9 of his 11 points in the fourth quarter, suffering through an off 3-of-9 shooting night, but managed to contribute 5 assists. Tyrese Morrison finished his career with 10 points and 3 assists. No. 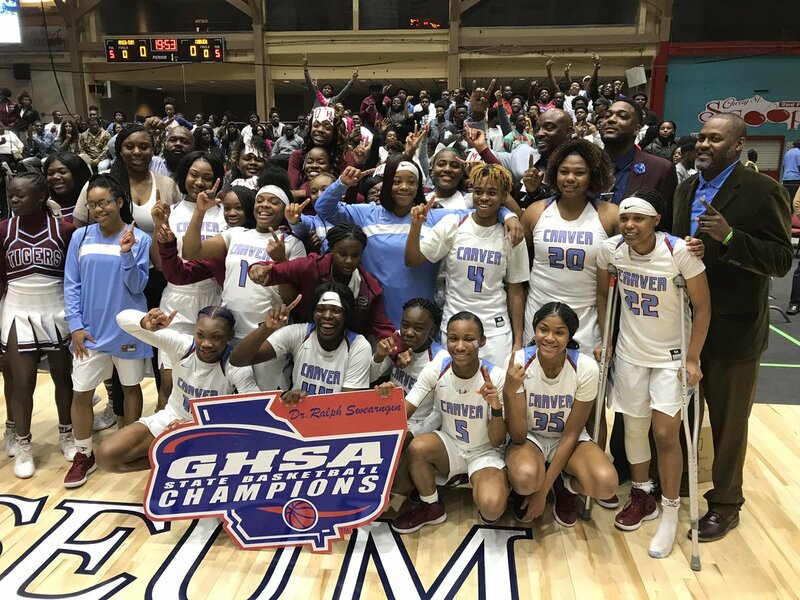 1 Carver-Columbus (32-0) finished off a perfect season as the Lady Tigers avenged last year’s 58-51 semifinal loss to No. 4 Spalding (25-5). The Jaguars struggled with Carver’s size, quickness and length at every position and saw the Tigers race out to a 17-9 lead after one. Midway through the second quarter the Jaguars had accumulated 14 fouls to Spalding’s five before the count was 16-10 at the half. 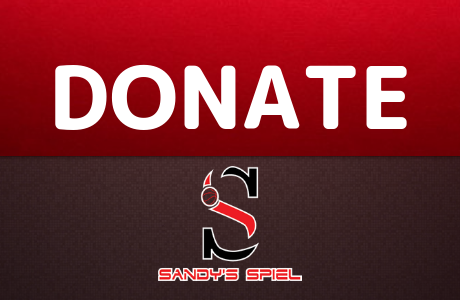 Carver went 16-of-23 from the foul line to take advantage but Spalding still trailed by just six points at 32-26. The Jaguar offense sputtered in the third quarter as the Tigers outscored Spalding 11-2 to balloon their lead to 43-28 before cruising to the title. Olivia Cochran finished with 15 points, 11 rebounds, 2 assists, 2 steals and 2 blocks. West Georgia-signee Jailyn Shaw posted 13 points and 14 rebounds while KeKe Gaines added 11 points and 5 rebounds and Sadrea Mabry scored 10 points. 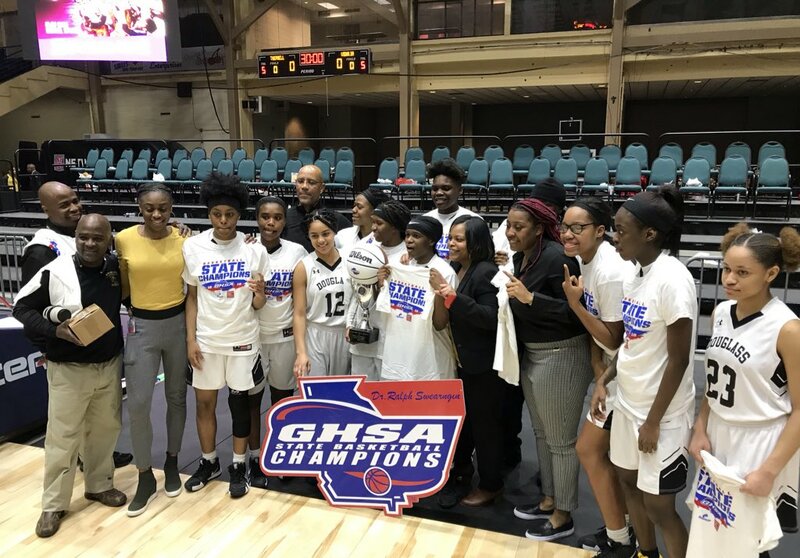 Columbus State signee Ja’Nya Love-Hill finished her high school career on the bench after an injury at the 1:30 mark of the third quarter with Carver up 40-28, but was able to celebrate Carver’s first title. Spalding was led by Corriana Evans’ 21 points, 18 rebounds, 3 steals and 4 blocks. Aniaya Jester struggled through an off shooting night going 4-of-18 for 12 points, 6 rebounds, 3 assists and 6 steals along with 7 turnovers. As a team, the Lady Jaguars managed to shoot just 25.5 percent. No. 5 Carver-Columbus (26-5) led for only 47 seconds of the game and stunned No. 7 Americus-Sumter (26-5), beat the Panthers for the fourth time and claimed the program’s first title since 1971. Americus-Sumter jumped out to a 7-0 lead early and rode 6-foot-7 senior Josh Lusane to a 13-8 lead after one. At the half, the Panthers led 23-20 after their largest lead came at 17-8 at the 4:39 mark. Americus-Sumter couldn’t gain separation in the third quarter as AJ Watts and Devin Flowers bombed from deep, Watts hitting back-to-back threes to cut the lead to 27-26 with 5:05 remaining but a late Wallace Bradley hoop helped Americus-Sumter carry a 37-35 lead into the fourth. Following a Bradley three, the Panthers extended their lead to 42-35 with 7:01 left, their largest lead of the second half, but Flowers ignited a 10-4 run to make it a 46-45 game at the 4:41 mark after nailing one of his three threes on the day. Watts, the Region 1 Co-Player of the Year with Lusane, banked in a three from the right wing to give the Tigers their first lead of the game with 2:12 remaining at 51-50. Americus-Sumter shot 16-of-23 from the free throw line but left points at the stripe late. David Sumlin split a pair of free throws to leave the game tied at 51 with 1:50 to play before the Panthers forced a 10-second call and got the ball back with 1:39 left. Josh Moore converted a layup to regain the lead, but next possession Watts was fouled and split free throws to trim into the Panthers lead, making it 53-52. It looked as if Americus-Sumter was going to escape when Sumlin missed a free throw attempt but made his second to make it 54-52 before Watts traveled on the other end to give the Panthers possession with 40.7 seconds left, but Watts, who scored 10 of his game-high 19 points in the fourth quarter, drilled a fall away three in the same spot where he gave the Tigers their first lead, to go-ahead 55-54 with just 13.3 seconds remaining. Jalen King, who chipped in 12 points and 7 rebounds, went 1-of-2 from the line with 3.1 seconds left to give Carver a 58-55 advantage. Americus-Sumter couldn’t get a clear inbound pass as Watts clinched the championship with a steal to run the clock out. As a team the Tigers went 9-of-20 from deep, Watts hitting six and Flowers who finished with 18 points, three. Americus-Sumter was led by Lusane’s 19 points and 10 rebounds as the Panthers outrebounded Carver 36-23. Quevoluia Willoughby collected 10 points and 7 rebounds in the loss while Bradley added 10 points. Postseason hero Trae Brown was held to 4 points on 1-of-7 shooting. Carver stuns A-S. Lead for only the final 49 seconds of the game. @AnthonyAJWatts with go-ahead three & game clinching steal. No. 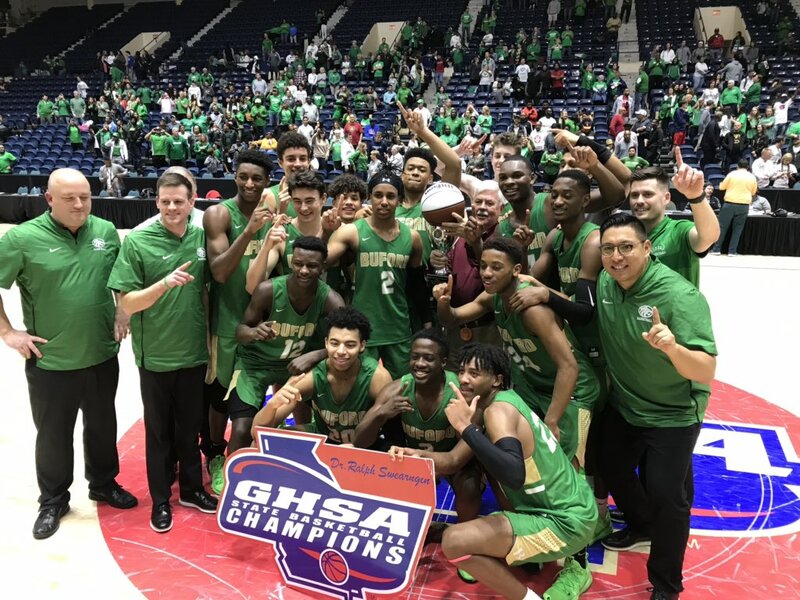 1 Buford (29-2) pulled away in the fourth quarter to complete a three-peat and end No. 2 Villa Rica’s quest for perfection. The Wildcats (32-1) led 12-10 after the first quarter but saw Kentucky-signee Deasia Merrill pick up two early fouls along with starting guard Aliyah Hindsman. Hindsman and Tee Windom scored six points apiece in the opening frame to pace Villa Rica in an action packed opening eight minutes. In the second quarter the Wildcats extended their lead to 28-20 at the 2:19 mark after Merrill sank two technical free throws — her only points of the half. Instead of impacting the game scoring the ball, Merrill dominated the glass and ignited fast breaks with outlet passes leading to eight fast break points as Villa Rica took a 33-29 lead into the half but in the second half, the transition buckets came to a screeching halt. Buford would limit the Wildcats to just two fast break points over the final 16 minutes as Blair Wallis and Preston Reid started to turn Villa Rica over with their full court pressure. Reid’s layup at the 3:52 mark gave Buford the lead for good at 41-40. Following a 2-point first half on 1-of-7 shooting, Tate Walters found her rhythm from deep, hitting three three-pointers in the third to help offset Windom’s five on the night, giving Buford a 49-47 lead heading into the fourth. 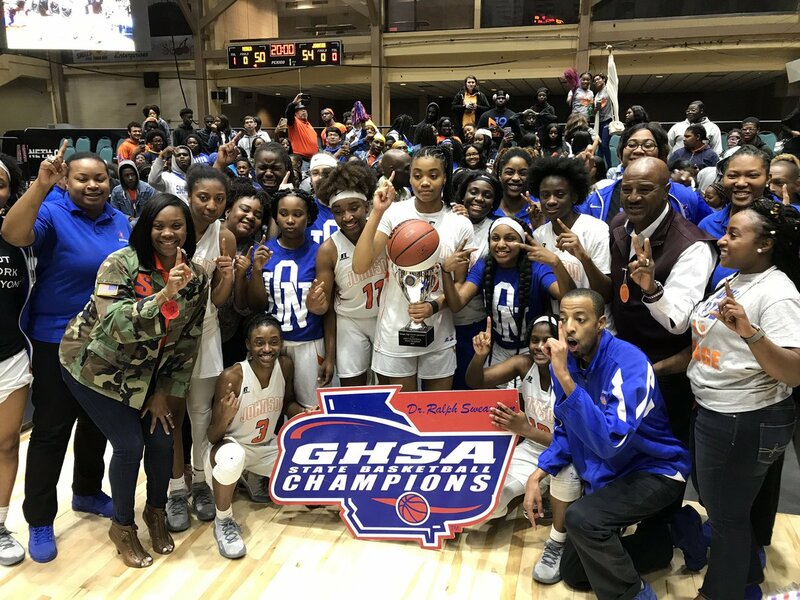 As their perfect season began slipping away, as did Villa Rica’s options on the perimeter with Aliyah Hindsman, Niya Hindsman and Kyndal Coleman all fouling out. After scoring seven points in the third quarter, Merrill was held to two points in the final period as Buford didn’t allow her any post up opportunities. Trailing 60-51 with 3:04 remaining, the Wildcats finally scored after three-plus minutes of no offense as Niya Hindsman and Windom scored layups to make it 61-55 at the 2:26 mark. Buford provided the dagger with 1:08 left when Casey Jones dropped off an assist to Abbi Perkins for a layup to make it 64-57. Buford went 8-of-24 from three, 15-of-29 from the line — going just 8-of-16 in the fourth quarter — and outrebounded Villa Rica 38 to 34 in the win. Walters finished with 16 points, 4 rebounds and 3 assists while Wallis scored 11 points off the bench. Jones scored 9 points and Ashyia Willis tallied 8 points and 5 assists. Tee Windom led Villa Rica with 21 points and 5 rebounds while Merrill collected 11 points (3-10 FG), 14 rebounds, 8 assists, 2 steals and 5 blocks but had 8 turnovers. Dekyia Cofield added 10 points and 5 rebounds. An 8-0 spurt spanning 58 seconds in which Oklahoma State-signee Marcus Watson scored five points and High Point-signee Eric Coleman netted three propelled No. 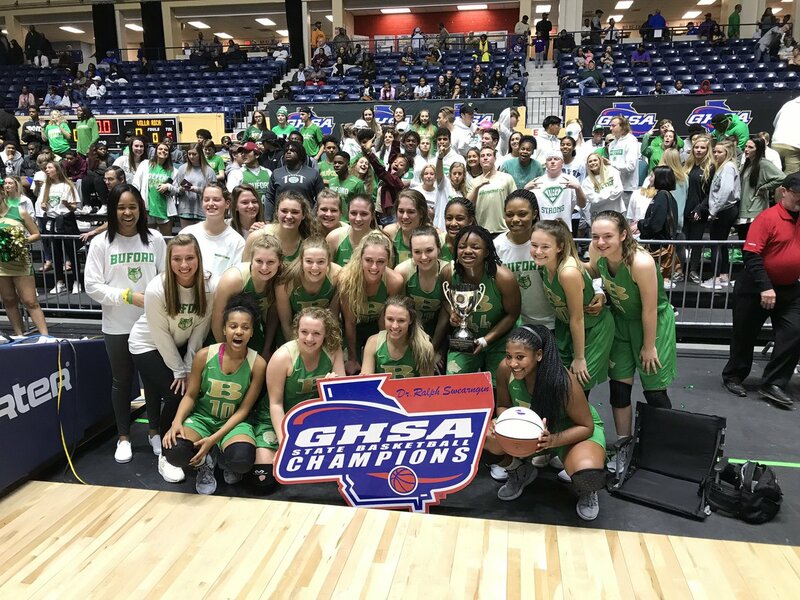 1 Buford (29-2) to their second state title in three years, putting away a feisty sharpshooting No. 7 Fayette County (26-6). Watson (17) and Coleman (14) powered the Wolves to a 39-31 lead at the half combining for 31 points. At the 5:02 mark of the third quarter JeKobe Coleman drilled a deep three to ignite a 10-0 run which tied the game at 46 with 2:53 remaining as Coleman and Ricky Knight locked in from beyond the arc. Buford countered with Watson to push ahead 51-46, but Fayette County used a 7-2 flurry to head into the fourth quarter tied at 53 as Coleman hit three threes. At the 7:32 mark of the fourth, Terrell Bradley gave Fayette County their first lead since 15-14 by hitting two free throws to make it 55-53. Tied at 58 with 4:38 remaining, a close charge/block call went in the favor of Buford as Watson was sent to the line for two free throws, sparking the decisive 8-0 run. During the run Watson hit a step back corner three and Coleman finished an And-1 to make it 66-58. Minutes later Knight sliced into the lane for a tough hanging floater to cut the lead to four, but on the ensuing possession Coleman landed the kill-shot with a straight away three to make it 71-64 with 2:09 left. Knight hit the last of his six three-pointers with 40 seconds left to bring the score to 74-69 but Donell Nixon sank two free throws to end all hopes of a comeback. Buford outrebounded Fayette County 42-23 and kept pace with the Tigers’ three-point shooting, nearly matching them by going 8-of-19 from deep compared to Fayette’s 9-of-24. 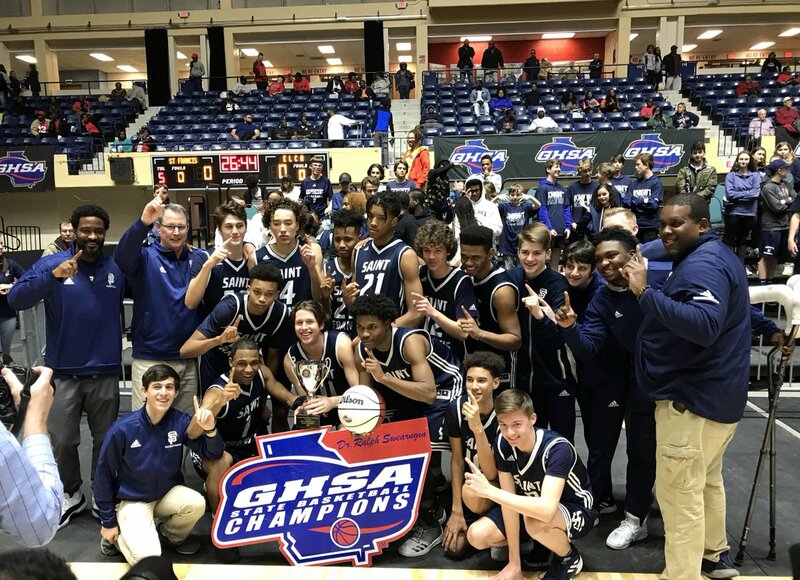 Watson earned his second state title with a 33-point (9-15 FG; 4-7 3PT; 11-14 FT) 10-rebound performance while Coleman proved to be the missing piece, transferring in from King’s Ridge in the summer and posting 25 points (7-12 FG; 3-5 3PT; 8-11 FT), 9 rebounds and 4 blocks. Wingate-signee Donell Nixon added 8 points and 6 rebounds. In the loss, Knight shined for the Tigers with 26 points (8-12 FG; 6-8 3PT; 4-4 FT). Coleman scored 15 points followed by Josh Dupree’s 12 points, 4 rebounds, 7 assists and 2 steals. Bradley rounded out Fayette County’s attack with 10 points, 4 rebounds, 3 assists, 1 steal and 1 block. Facing the state of Georgia’s premier program, No. 4 Lanier (29-3) turned the game into a rock fight a slayed Goliath, No. 1 Lovejoy (29-4), using a 21-8 fourth quarter to shake the country, ending nationally ranked Lovejoy’s quest for a repeat. The Longhorns jumped out to a 5-0 lead in a whistle happy contest but saw 6-foot-4 junior Christabel Ezumah pick up her second foul just 1:34 into the game. And the end of one, Lanier was tied with Lovejoy 7-7. The Wildcats went on a 10-0 run to pull ahead 13-9 but Genesis Bryant was banished to the bench with three fouls. Taylor Stanley came off the bench to hit a timely three for Lanier to stem the tide but Ezumah soon after earned her third personal. At the half Lovejoy led 26-21 with Anaya Boyd scoring 12 points but the Wildcats shot just 36 percent, while Lanier went 4-of-8 from three. In the third quarter Lovejoy surged ahead for their largest lead of the game at 35-27 with 2:08 left as Bryant knocked down a transition three but junior 6-foot-2 post Lizzie Campbell scored inside late to cut the lead to 37-31 heading into the fourth. Campbell logged major minutes in the absence of Ezumah and came up big, finishing with 8 points, 8 rebounds and 1 block. Lanier dominated the fourth quarter much like they did against No. 2 Forest Park in the semifinals when they looked dead in the water. Kalen Surles, an unsigned 5-foot-10 guard, took over down the stretch besting Boyd and Bryant as she helped ignite a 7-0 run to take a 38-37 lead at the 5:51 mark. Surles knocked down a three to tie the game at 41 and then assisted to Campbell to move ahead 43-41 with 2:50 left, a lead that would stand until the final buzzer. Bryant buried a three at the 1:18 mark to make it 48-44 but the Wildcats were rushed in their shot selection and settled for tough threes. Lovejoy was held to 3-of-14 shooting (21.4%) while shooting 1-of-11 (9.1%) from deep. Lanier went 7-of-13 from the foul line down the stretch with Mekala Fuller going 5-of-8 on the night to help preserve the win. Nala Lawrence led Lanier with 10 points and 4 rebounds while Surles scored seven of her 9 points in the fourth quarter and added 4 rebounds, 7 assists, 4 steals and 1 block. Fuller netted 8 points while Ezumah had 7 points, 6 rebounds and 2 blocks. Taylor Stanley hit two threes. Lovejoy saw Boyd finish with 15 points, 4 rebounds, 3 assists, 3 steals and 2 blocks. Bryant finished with 8 points along with Mariah Spain. Unsigned senior DaMarcus Johnson struggled with his shot at the Macon Centreplex and had five points heading into the fourth quarter but the human microwave set the temperature to Ball Game as he scored eight of his team-high 13 points in the final frame including drilling the game-winning three at the buzzer to cap a wild 16-6 fourth quarter to give No. 1 Tri-Cities (26-6) their first state title in school history rallying past No. 5 Tucker (28-5). The Bulldogs led 9-6 at the end of the first quarter but Tucker took control with a 12-2 run and led 22-18 at the half holding the Bulldogs to 27.3 percent shooting while 6-foot-6 junior Jermontae Hill and David Giddeon hurt Tri-Cities with their length around the basket, scoring eight points apiece. Tucker continued to make life difficult on the trio of Johnson, Peyton Daniels and Titus Hunter and saw Braelon Seals slash to the basket for a buzzer beating layup to extend the Tigers’ lead to 37-30 heading into the fourth. At the 7:07 mark Hill picked up his fourth foul on a charge and less than three minutes later up 39-33, Hill fouled out with a game-high 14 points on an efficient 5-of-8 shooting. From that point on, the 4:35 mark, the battle tested Bulldogs smelt blood in the water and began to claw back — outscoring Tucker 13-4 with Hill on the bench and holding the Tigers without a field goal in the fourth quarter (0-4). Hunter, the Region 5 Player of the Year, started the comeback with a free throw but from there it was Johnson’s moment, scoring eight points over the span. Freshman Raylan Barrion hit a pair of free throws to slow momentum at 41-36, but Hunter hit a layup at the 2:39 mark to cut the lead back to three. Johnson delivered a three that bounced on the rim and dropped after a heroic Hunter offensive rebound that tied the game up at 41 with 1:17 left to play. We are TIED!!! @hoop_dtj hits just his second FG! Tri-Cities hasn’t led since 14-12. With 25 seconds left and their primary ball handler on the bench, Nick Watson, the Region 4 Player of the Year, was forced into ball handling duties and turned it over leading to a Demetrius Rives layup in transition, the Bulldogs’ first lead since 14-12. Watson redeemed himself however, getting to the foul line with 6.9 seconds left and sinking both free throws, but Johnson put on his cape and drilled a long bomb three as time expired to complete the comeback. The unsigned SENIOR! @hoop_dtj wins the Class 6A State Championship! Daniels finished with 12 points and 5 rebounds while Hunter had 11 points and 4 rebounds. Giddeon had 9 points and 9 rebounds for Tucker. Barrion scored 8. A quick start afforded No. 1 Westlake (30-0) all the space they needed as the young Lions repeated as state champions and held off a hard charging No. 2 Collins Hill (30-2) who closed to within 40-38 with 1:10 left in the third after an 11-0 run powered by Georgia-signee Javyn Nicholson who scored seven points and finished with 17 points, 15 rebounds, 1 assist and 3 steals to finish. Westlake led 17-8 through the first quarter and ran its lead to 25-10 in the second quarter before settling with a 32-21 advantage at the half. In the third quarter the Eagles trailed 38-27 when Jordan Releford went down with an injury. Turning to a full court press, Collins Hill rallied around their fallen teammate and swarmed the Lions before heading into the fourth quarter down 42-38. Over the final eight minutes, Westlake kicked it into overdrive behind 6-foot-4 junior Lydia Freeman and sophomore sensations Raven Johnson and Brianna “Snoop” Turnage. The trio combined for 16 of Westlake’s 18 points in the fourth quarter to put the game away. Johnson finished with 16 points, 5 rebounds, 4 assists, 2 steals and 1 block. Freeman had 16 points, 9 rebounds and 2 blocks. Turnage chipped in 14 points, 7 rebounds, 2 assists and 1 block. Bria Harmon had 13 points in the loss while Releford posted 7 before the injury. No. 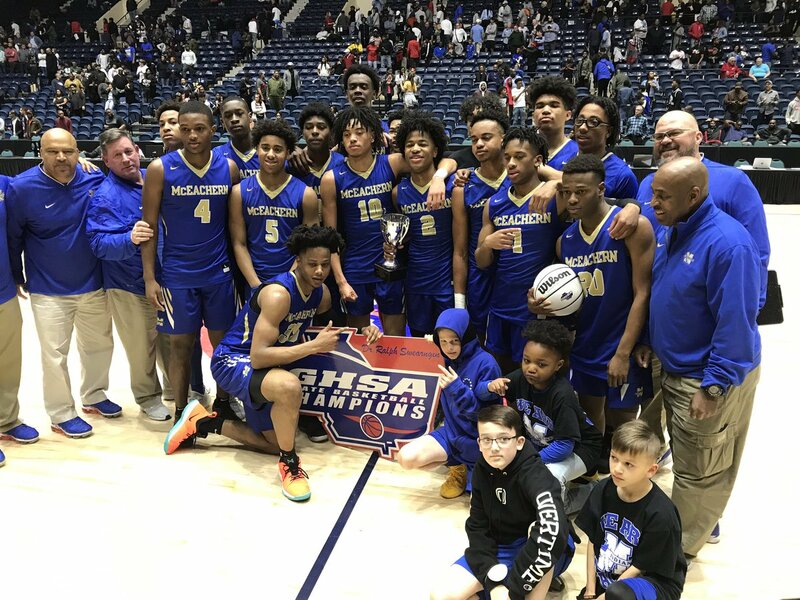 1 McEachern (32-0) earned their first state title the hard way, battling foul trouble and the defending state champion No. 3 Meadowcreek (26-6) to capture the ever elusive Class 7A state championship. The Mustangs led 15-11 with 1:37 left in the first quarter using an 8-0 run to pull ahead but McEachern countered with a 7-0 streak to close the frame up 18-15 as Sharife Cooper scored seven points. A Jared Jones basket inside made it 28-17 but the story was the Indians’ sharpshooting as they connected on 57.1 percent of their shots including going 7-of-14 from deep as Cooper finished the half with 17 points and Alyn Breed 11. South Florida-signee Jamir Chaplin scored 11 points to pace Meadowcreek but they trailed 38-28 at the break. UAB-signee Jalen Benjamin got Meadowcreek off to a quick start with five straight points to cut the lead to 38-34 but he picked up his fourth foul at the 4:36 mark down 42-34 while Cooper was sent to the bench with his fourth just nine seconds later. 57 seconds later, Temple-signee Damian Dunn and Quinton McElroy were tagged with their fourth fouls on a double foul away from the ball. McEachern carried a 49-42 lead into the fourth quarter and led 51-47 with 4:49 left in the fourth when Cooper and McElroy checked back in. Meadowcreek had their chances to narrow the gap or take the lead but with their top scoring options of Benjamin and Dunn sidelined, the Mustangs couldn’t muster enough firepower as Jerod Bush and Braden Sparks played key minutes down the stretch for McEachern to fill in defensively for Cooper and McElroy. The Mustangs ran out of gas and out of star power when at the 3:42 mark Dunn fouled out on a free throw box out as his elbow connected with the face of McElroy, disqualifying him with the Mustangs down 52-47 before McElroy sank both free throws to put the game out of reach. McEachern turned the ball over 22 times compared to Meadowcreek’s 14, but the Indians shot 52.9 percent from the floor and hit 19-of-25 free throws. McEachern didn’t make a three in the second half and due to limited playing time Cooper only scored three points, but the All-American finished with a game-high 20 points and 4 assists. Isaac Okoro was a handful going down hill, posting 16 points, 4 rebounds and 4 assists. Breed stepped up in the first half especially and ended the night with 15 points and 6 rebounds. Meadowcreek was outrebounded 28-12 and saw the Indians corral 12 offensive rebounds alone. Benjamin led the Mustangs with 19 points — 13 in the second half. Chaplin tallied 13 points and 4 rebounds while Dunn had 9 points before fouling out. Kedrick Green had 7 points. 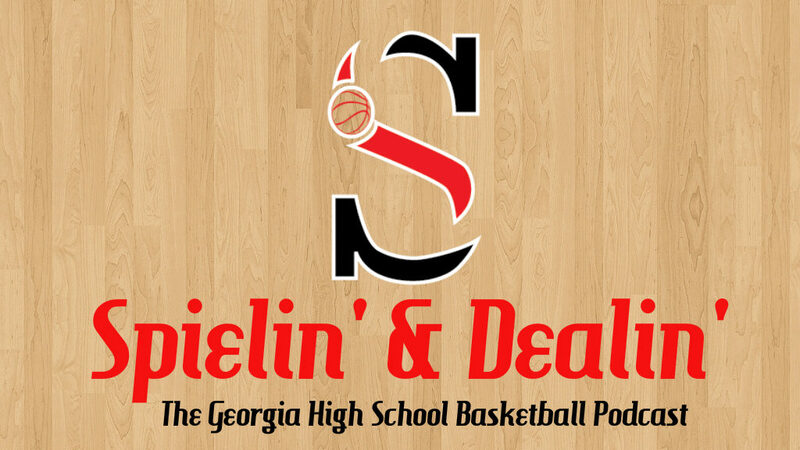 Kyle Sandy previews the GHSA Georgia High School Basketball State Championships. 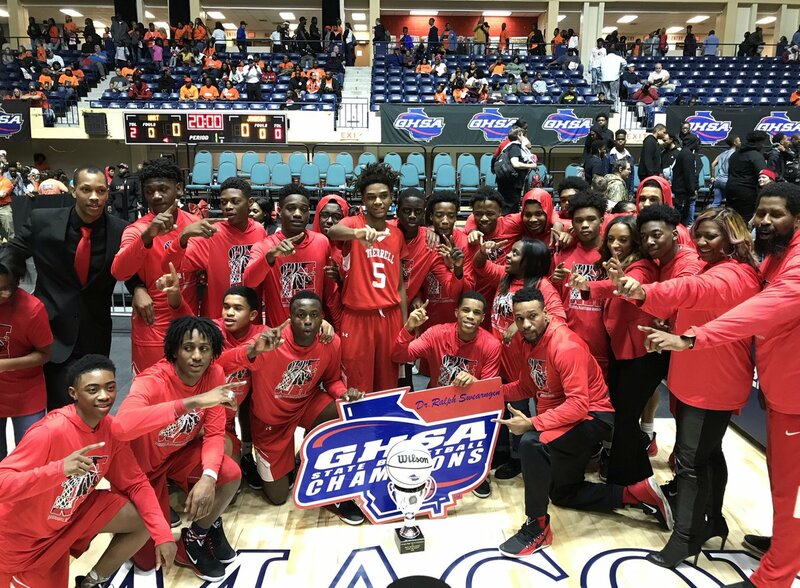 Kyle Sandy previews the 2018-19 GHSA Boys Basketball Final 4. 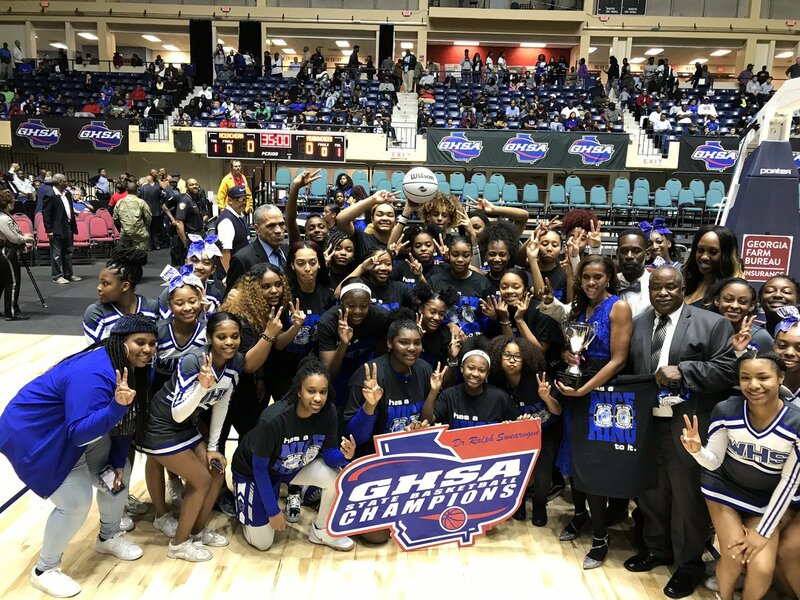 Kyle Sandy previews the 2018-19 GHSA Girls Basketball Final 4.